The Apple tablet is almost here. We hear. Actually, we're hearing a whole lot lately. With this exhaustive guide to every tablet rumor, we've got the clearest picture of the Apple tablet yet. Updated constantly. 1/26/2010: The WSJ reports from last-minute negotiations with the publishing industry that Apple's pushing prices of $12.99 and $14.99 for hardcover bestsellers for the tablet. 1/26/2010: Talking to game devs, Kotaku found out that one tablet game from EA "allows gamers to move a map with one hand and do the 'mouse work' with the other, using a combination of multitouch and 'gestures.' "
Could Apple&apos;s Tablet Use Natal-Like Technology? 1/26/2010: McGraw-Hill's CEO just confirmed on CNBC that Apple's announcing the tablet tomorrow and that it'll run an iPhone-style OS, and gosh darn it, it's "terrific." 1/26/2010: The New York Times reports a few worthy bits: The tablet will have 3G, and iPhone apps will be compatible with the tablet. Presuming that's true, the questions now turn to the carrier(s) and how those iPhone apps will work on the tablet. 1/25/2010: 9to5Mac claims to have talked to some publishers who have the scoop on the tablet, and they say the cost will be "[nowhere] near $1000, as has been reported elsewhere." 1/25/2010: The LA Times reports that the NY Times has been cooped up in Cupertino for the last few weeks developing a version of its paper for the tablet. The article also has a quote from a Conde Nast press release in which the publishing giant just comes out and says it: they will develop "more content for the iPhone and the anticipated tablet from Apple." 1/25/2010: Tech Crunch heard through the grape vine that Steve Jobs said of the tablet, "This will be the most important thing I've ever done." 1/22/2010: Fox News' Clayton Morris has heard Apple's "in talks" with both Verizon and AT&T to provide data for the tablet. 1/21/2010: A truckload from the WSJ: Apple "envisions that the tablet can be shared by multiple family members to read news and check email in homes," and has experimented with facial recognition through a built-in camera, along with virtual sticky notes that can be left behind. Also backing up our earlier report, the WSJ Apple's in discussions with newspaper, mag book publishers like the NYT, Conde Nast and Harper Collins, and has "exploring electronic-textbook technology." EA is apparently on tap to demo video games for it. Also curious: The WSJ says Steve Jobs is "supportive of the old guard and [he] looks to help them by giving them new forms of distribution," referring to old media companies, which echoes a quote in the NYT that in the battle over ebook pricing with Amazon, apparently "Apple has put an offer together that helps publishers and, by extension, authors." 1/19/2010: Apple's shell company, Slate Computing, has also filed for a trademark on the name iPad. Oh God help us. 1/18/2010: Apple invited everyone to "come see our latest creation" on Jan. 27, matching reports from All Things D and the WSJ that Apple would hold an event in late January to announce the tablet. 1/18/2010: The WSJ reports Apple's talking to HarperCollins about ebooks for the tablet—the first non-mag or newspaper reading content we've heard of. 1/14/2010: Apple hit Gawker with a cease-and-desist letter talking about how Gawker's bounty for Tablet info is a no-no, which seems like a sorta soft confirmation there is something, since that's when Apple tends to sue people. 1/13/2010: It might be like an "iPhone on steroids." 1/12/2010: The Grubes hears there is "no camera, webcam or otherwise, on The Tablet." 1/11/2010: Apple just turned off the lights at Fingerworks.com, whose IP could show up in the tablet. Why Did Apple Just Now Turn Off the Lights at Fingerworks.com? 1/10/2010: France Telecom/Orange exec Stéphane Richard may or may not have said "yes" to questions about a webcam in the tablet. 1/8/2010: Apple's been working on a multitouch version of iWork for a couple of years, according to a former Apple designer. Could it be for the tablet? 1/8/2010: Reuters reports that AVY Precision Technology will start producing "aluminum casings" for the tablet next month, in time for a "second quarter" launch. AluminummMmmm. 1/7/2010: This is a really neat patent for using the screen's pixels themselves as touch sensors (instead of placing the touch layer on top of the display), leading to super thin devices. 1/6/2010: Apparently, Apple expects to sell 10 million of them this year, according to a former Google exec, though his information didn't come from Apple, so I'm not sure who's expecting what then. 1/4/2010: The WSJ again says it's shipping in March after being announced later this month (though the "ship date hasn't been finalized and could still change"), while All Things D says more specifically it's being announced Jan. 27. The WSJ also says it "will come with a 10 to 11-inch touch screen," that "Apple was working on two different material finishes for the device" and cites analysts who claim it will be $1000, which might include unlimited Wi-Fi hotspot access of some kind. The iPhone was called the iPhone years before Steve Jobs ever took the stage to announce it. We don't have the luxury of such clarity here. I would think the name has no more than two syllables, personally. Overwhelmingly what "evidence" there is points to some form of Slate. Not only did Apple register the domain iSlate.com through an intermediary to keep it a secret (discovered by Mark Gurman), they've trademarked it through a shell company called Slate Computing (signed for by Apple's Senior Trademark Specialist) and registered domains and trademarks in Europe through their usual IP law firm, utilizing their standard secret trademark practices, last used with the iPhone. They've also registered "Magic Slate" through the same company. And, while we initially blew off NYT editor Bill Keller referencing an "Apple Slate" in a speech as meaningless, it's a whole lot curiouser now. Borders referenced an "Apple iPAD" in a survey, but it sounds like the sad invention of a survey copywriter who hit caps lock instead of shift, not to mention a digital feminine hygiene product. Apple also registered a trademark for TabletMac, but most likely to protect the Mac brand name from modders (it sounds unwieldy and gross). Apple's put a lot of effort into iSlate it seems. Is that the name of the Apple Tablet? Update 1/4/2010: The WSJ again says it's shipping in March after being announced later this month (though the "ship date hasn't been finalized and could still change"), while All Things D says more specifically it's being announced Jan. 27. Well, obviously everybody who picked a day before today is wrong. Which leaves everyday after today! The overall consensus is that's being announced in late January—note, though, that a lot of the people who're part of the new January cabal were the same people convinced it was coming in the fall. said two days ago that Apple is expected "make a major product announcement on Tuesday, January 26th" at the Yerba Buena Center for the Arts in San Francisco, where Apple's rented a stage for "several days." Silicon Alley Insider says that Apple is going to demo a tablet in January. But when can you actually hold one? From most to least specific: The Wall Street Journal says the tablet is actually going to ship in March, and an analyst said it's coming in March or April. iLounge says it'll hit stores in May or June, like the iPhone. Digitimes reported Foxconn is supposed to have almost half a million of 'em shipped by April. Little emperor of Apple analysts Gene Munster says the first half of 2010. A bunch of connected Mac people just say 2010. The iPhone was $600. Then sales stopped being a-mazing and it dropped to $400. When the iPhone 3G came out, it went to $200 and everybody bought one. So, uh, how much is the tablet gonna be? Update 1/4/2010: The WSJ cites analysts who claim it will be $1000, which might include unlimited Wi-Fi hotspot access of some kind. Everybody says roughly the same thing: AppleInsider has said it's "expected to retail for somewhere between the cost of a high-end iPhone and Apple's most affordable Mac notebook." Our insider told us it would "cost $700 to $900," or "more than twice as much as a netbook." Taiwan Economic Times says it's between $800 and $1000. China Times, while they got the date pegged to the price horribly wrong, said 800 bucks. And then there's DigiTimes, who says the whole reason the tablet was "delayed" was because it was getting an OLED upgrade, so it'd be a whopping $1500 to $1700. The final word comes from Steve Jobs who said "we don't know how to build a sub-$500 computer that is not a piece of junk." Survey—and logic—says it'll be pricier than an iPhone and more expensive than a MacBook. Which doesn't say a lot. If you had to pick a number, $800ish seems like the safest bet. The most important spec—and maybe the biggest mystery—is, well, how big the tablet is. Three sizes dominate rumors, tied to the size of panels produced by display manufacturers: 7 inches, 9.6 (or 9.7) inches, and 10.6 inches. Let's go from least to most specific. Apple reportedly told publishers it's "small enough to carry in a handbag but too big to fit in a pocket." A company discovered in its traffic logs an "unannounced Apple product with a display somewhere between an iPhone and a MacBook," reported the NYT. The WSJ reported it's "smaller than [Apple's] current laptop computers but bigger than the iPhone or iPod Touch." Apple analyst king of the dweebs Gene Munster, after speaking to "component contacts" in Asia, says it's between 7 and 10 inches. TechCrunch says it's 7 or 9 inches. Digitimes says there's two tablets, one that's 9.6 inches (with OLED) and another that's 10.6 inches. Taiwan Economic News says 9.6 inches too. Actually respectable news organization Dow Jones says Apple ordered displays from Wintek that are "between 9.7 and 10 inches." Oh, and there might be ginormous tablets somewhere out there. Update 1/4/2010: The WSJ says it "will come with a 10 to 11-inch touch screen." The Financial Times and Reuters both say it's 10 inches. So does our insider. Let's just stick with bigger than an iPhone, but smaller than a MacBook. There's been surprisingly little discussion of the actual specs beyond the size of the screen—storage, memory, processor, etc. Most of what little talk there has been has revolved around the networking capabilities. There could be versions with 3G and without. Specifically, HSDPA (meaning it would only work on AT&T or T-Mobile in the US). Oh look, a SIM card tray! But maybe it'll be on Verizon said BusinessWeek. Hey, maybe even Verizon LTE 4G wireless! strong>Update 1/6/2010: Chalk up another vote on Verizon wireless inside. This analyst is sure: "Definitely Verizon. I've been told that's a certainty." Mmmmhmmmm. Update 1/4/2010: Not really "inside," but the WSJ says "Apple was working on two different material finishes for the device." Fuzzy and rubbery? Update 1/8/2010: Reuters reports that AVY Precision Technology will start producing "aluminum casings" for the tablet next month, in time for a "second quarter" launch. Aluminum. Mmmm. Update 1/10/2010: France Telecom/Orange exec Stéphane Richard may or may not have said "yes" to questions about a webcam in the tablet. Update 1/12/2010: The Grubes hears there is "no camera, webcam or otherwise, on The Tablet." Aaaaaannnd it coooooooould have an OLED screen, if it cost 1500 bucks. A 3G option seems very possible, as does a secret-sauce processor, but who knows? Um, Steve Jobs, duh. A whole bunch of new multitouch engineers. Oh, and the Newton guy is back. Quanta might be making it. Or Foxconn (who makes the iPhone and got a guy killed over a leaked prototype). With a display made by LG (who makes the gorgeous, if flaky, panel inside the 27-inch iMac.) Or maybe the display's from Wintek, according to Reuters and Dow Jones. The battery might be made by Dynapack. Besides Apple, again, who knows? The thing about patents is that, besides the fact they're patenting something, they don't say a whole lot, at least not about actual products. But here's a few interesting ones pertaining to a tablet. Update 1/5/2009: A real interesting one is for a "touch screen device, method and graphical user interface for manipulating three-dimensional virtual objects." Update 1/7/2010: This is a really neat patent for using the screen's pixels themselves as touch sensors (instead of placing the touch layer on top of the display), leading to super thin devices. 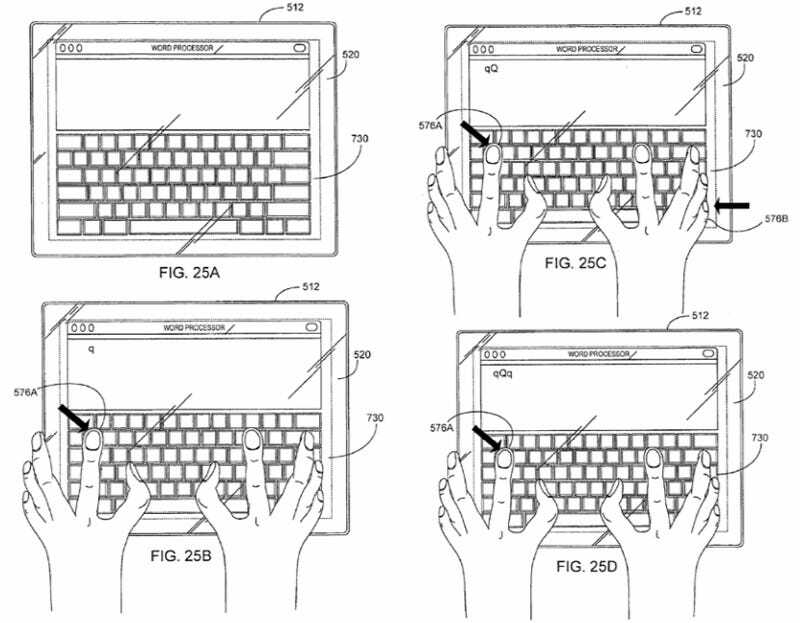 This patent for a "display housing for a computing device" sure sounds like a tablet, which might fit into the tablet docking station in this patent, and you might use two hands, as shown in this patent, to interact with a multitouchable OS X, generously illustrated in this patent, unless you use a pen (ha ha ha). And it might be bumpy, in a cool way. Patents don't mean a whole lot, so don't expect any of them to actually make it into a tablet. They could, though. It's fairly well known the iPhone was born from efforts to develop a touchscreen tablet computer. It was simply miniaturized, and uses tech from FingerWorks, a touch interface company Apple bought. The NYT reported Apple's been working on it since 2003, when they built several prototypes using a battery-slaying PowerPC processor. Our insider said that Apple's been working on it for 4-6 years, and that the first prototype of the current version was developed in 2008. Steve Jobs killed the PowerPC tablet, according to the NYT, because Jobs asked what tablets were good for besides surfing the web while sitting on the toilet. The WSJ reported he's killed it twice already. Apple Working on a Tablet Since At Least 2003? Update 1/6/2010: Apparently, Apple expects to sell 10 million of them this year, according to a former Google exec, though his information didn't come from Apple, so I'm not sure who's expecting what then. Update 1/11/2010: Apple just turned off the lights at Fingerworks.com, whose IP could show up in the tablet. Apple has maintained the types of information and things you are soliciting-"how it'll work, its size, the name, the software," as well as any possible details about the product's appearance, features, and physical samples-in strict confidence." Perhaps the most important question of all: What's it actually like? Most of the excitement lately is that it's going to redefine newspapers and magazines—we broke the news, using multiple sources, that Apple was talking with several media companies rooted in print about content for the tablet. Also, we heard there might be some kind of textbook content too. Plus, we're not the only ones who've heard it's got an ebook bent. Also, well, it depends on the OS. iPhone OS 3.1 had clear traces of new Apple iProducts, and some people say it's a bigass iPod touch, or at least running iPhone OS, which sorta fits with iPhone app developers supposedly being asked to make higher res versions of their apps for demonstration. It apparently fits in with the iTunes remodeling Apple's got going on. Update 1/13/2010: It might be like an "iPhone on steroids." Update 1/8/2010: Apple's been working on a multitouch version of iWorks for a couple of years, according to a former Apple designer. Could it be for the tablet? The NYT reported "You will be very surprised how you interact with the new tablet," whatever that will come to mean. As much as Steve Jobs saying they've got some "interesting ideas" about small computers, presumably. Martha Stewart is hyped about it, maybe 'cause it has something to do with diners. Steve Jobs on Netbooks: "We&apos;ve Got Some Interesting Ideas"
Everybody pre-conceived the iPhone based on the iPod and, to a lesser extent, the Newton. Everybody was wrong. 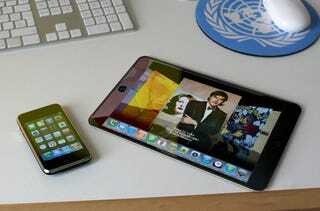 Today, most everybody is pre-conceiving the tablet based on the iPhone. Maybe we're all wrong again, or maybe the leaks are better this time. You know our mantra about rumors: Never trust them. But putting all of them together, we've definitely got some ideas now. If there's any rumor we missed—or you have a tip (we're good at keeping secret identities)—let us know.